Woohoo! It's time for the Bloggy Giveaways. 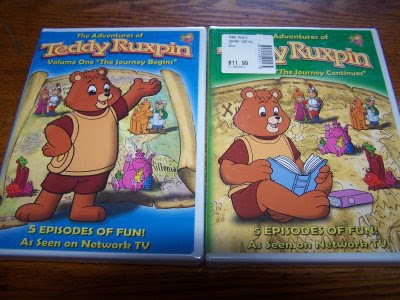 This giveaway is for 2 Teddy Ruxpin dvds. These are volumes 1 and 2, which include episodes 1-10. The value of this giveaway is approximately $24. To enter this giveaway, all you have to do is leave a comment below. If you’d like two entries for this prize, you can write an article about this giveaway and/or Little Fun; Little Learning on your blog. If you decide to use this route, please leave a separate comment below with the link to your article. Unfortunately, blogger does not provide me with email addresses of commenters. Please leave a way for me to get in touch with you or check back next week when I will announce the winner. Please check out my other giveaway at Thrifty Mommy. You can click here to see a complete list of Bloggy Giveaway participants and prizes. There are already hundreds to choose from. I always loved Teddy Ruxpin and would love to share him with my kids. Thanks for the giveaway! My daughter would love this. I always wanted a Teddy Ruxpin but never got one. These would be great. Always try to have fun things to watch at my house for visiting children. I think my son would love these! He is 21 months! i loved watching him as a kid and sure my boys would love these!! thanks for a chance to win! This brings back memories. I loved my Teddy Ruxpin book reader. My kids would love these! Thanks for the chance to win! I remember Teddy Ruxpin! Thanks for the chance to win. Teddy Ruxpin was my son's favorite, I would love to give these to my granddaughter. Used to love Teddy Ruxpin, love to show my kiddos him! My daughter said enter enter!!!! She wants to watch all the episodes! this is the kind of thing i don't mind mind my daughter watching! looks wonderful! My boys would love 'em! my sons would enjoy these! Oh loved this show as a child and would love for my kids to know this cuddly little bear. Love Teddy Ruxpin! Bet our kids would, too. Thanks! My neice loves Teddy Ruxpin. Thanks for the chance. wud luv this ...rather my little girl wud!!! My daughter likes bears so I think she would enjoy these DVDs. I had a Teddy Ruxpin when I was little. It creaped me out though because his eyes would move. I think you put the casette tape inside of him. I bet my son would flip over these! It looks super cute and he always loves bears. I remember Teddy Ruxpin from when my kids were small! I think my 2 year old grandaughter would enjoy him now. I used to love Teddy. Thanks for the giveaway. Thanks these would be great to have around for when my nephew comes to visit! My kids would love to watch this. We adore Teddy in our home, thanks! I hope this is still open! I loved Teddy Ruxpin as a child! Please enter me! My son would love this thanks for having it. This would be great for my little one. I remember this as a child and would love to introduce Teddy to my son. Teddy Ruxpink is so cute. Wow, Teddy Ruxpin! That takes me way back. My e-mail address is in my Blogger profile. Thanks for the great giveaway! I haven't seen Teddy Ruxpin since I was a girl - I'd love to share this with my daughter. Thanks! I found a Teddy Ruxpin at a local garage sale for $! and gave him to my 3 year old daughter. He now is her best friend and never leaves her side. She would be on cloud 9 if she had dvd's. I never knew they made T.R. videos.